Buy one basket...second basket $10 off! 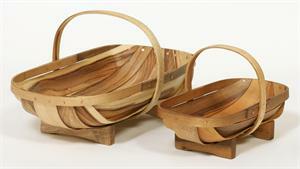 Set of two trugs - a large and a small trug nest perfectly and ships in one box to the same address. When you can't decide on a size or need a gift ... one for me, one for you! The gardener's best friends. Our English style trugs are the ultimate carrying baskets. Strong, lightweight and stable. 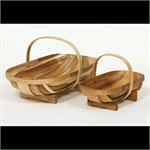 Elegant in style, they are lovely counter top or table baskets for fruit, vegetables and flowers. 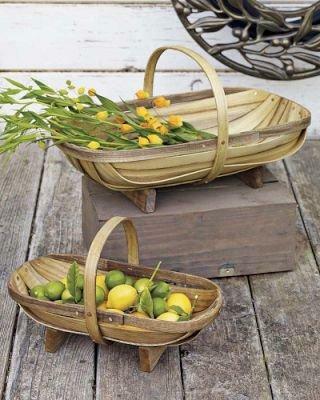 Picnic or beach basket, magazine basket, host basket, market basket; the list goes on. A Wall St. Journal 'Gift Pick' for gardeners and the all-time favorites of our friends and family.